The benefits of Brazilian Jiu Jitsu for children are incalculable. I have seen children come through the program at Brazilian Jiu Jitsu For Kids and change completely for the better. Children who were once shy become much more assertive and self confident. Students who were once distracted and have a hard time sitting still become attentive and very disciplined. 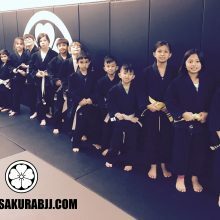 At, Sakura BJJ in Dover, NJ the children’s program director is a veteran public school teacher with 11 years experience. He works closely with all the other children’s instructors to ensure that each class is structured and all the children are learning and having fun. Increased physical activity. Brazilian Jiu Jitsu is a very active martial art. Our students regularly engage in “Bully Battles” where students grapple with each other. Increased self confidence: At Sakura BJJ in Dover, NJ we emphasize conflict resolution by standing up for yourself against bullies. Increased self control: At Sakura BJJ in Dover, NJ we offer very structured classes. Our instructors are taught to use many positive based techniques to correct undesired behaviors. We are confident that once your child enrolls in Brazilian Jiu Jitsu classes at Sakura BJJ in Dover, NJ It will be something they will do for the rest of their lives.